Confession of a Die-Hard Makeup Junkie ❤: SHuiYuki's Skincare Holy Grail! (✿◠‿◠) Many have asked me on my skincare routine and I will like to share with you all some of my Holy Grail (aka MUST HAVE) for my daily skincare routine! I'd been using Amethystory since October 2011 (about 7 MONTHS) all thanks to TheSampleStore for the sending me the products to try and I'd fallen in LOVE with ALL OF THEM ever since! 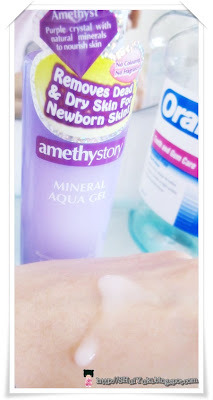 ✓ My face felt squeaky-clean but doesn't feel tight & dry after wash. AWESOME! ✖ Downside? Unlike I felt the product gave an initial sticky-gluey texture which make me irk in the beginning but the result is fairly similar to Cure Natural Aqua Gel. ✏ Verdict: If you are looking for similar product of Cure Natural Aqua Gel, this will be the product for your consideration and also, the price is MORE affordable than Cure (which cost S$42)! ✓ PERFECT foam cleanser I'd ever tried on! ✓ This cleanser survived for more than 3months as I just need one pump for my entire face & neck! ✖ Downside? I feel the foam cleanser doesn't really cleanse my face 100% so it can only as my morning cleanser during the day and double cleanser during the night. ✓ Really live up to it claim "help to absorb products better"
I felt my skin are more adaptable & reactive to other skincare products smacked on after using the enhancer. ✓ Not like regular alcohol-free toner as it is much thicker but yet skin absorb very quickly after patting them on. Impressive! ✓ My FIRST bottle has survived till date as I just 2 drops for my entire face & neck. LOL!!! Yeah! hurray to #SaveMoreMoney & #HelloBeautifulSkin!!! ✏ Verdict: If you have similar skin condition as me, I will seriously encourage you to give this product a try!!! You will not regret it! WATSONS: Check out their storewide SALES as they may have Buy 2 Get 1 FREE! 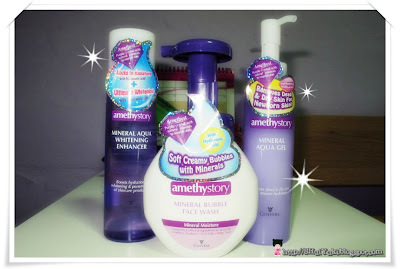 (っ◕‿◕)っ ♥ May these products bring you happier & fairer skin and till then, stay healthy & happy! "Good relationships don't just happen. They take time, patience, and two people who truly want to be together."